There are many reasons to plant a new tree such as shade, energy savings, wildlife habitat, edible fruit, decorative fruit, fall color or screening. Whatever the reason for wanting a new tree, you can be assured that there are many different options to choose from. You can find trees of every size, shape and color at Hillermann’s. No matter what your site conditions are, there is a tree that will work. Know your environmental conditions for the area that you want to plant; conditions like sunlight, moisture levels and soil type will be important factors to be aware of when choosing your tree. Do you have size constraints? No problem, there is a tree for you. You can find everything from a tree that can create a canopy over a street or one that will be perfect in that small pocket of your garden. Conservation: A properly placed shade tree can reduce your air conditioning bill by as much as 25%. Planting a shade tree due west or east of a window will reduce the amount of sun reaching your home. Select a tree that can be planted within 20 feet of the window and gets at least 10 feet taller than the window for proper shading. If you have a tree due south of a window trim up the lower branches so that you can take advantage of the winter sun to help heat your home. Increase Home Value: The United States Forest Service says that trees can increase the value of a home by as much as 20%. With careful planning your new trees will not only add to the beauty of your home, but as mentioned above they can save or earn you hard cash. Money does grow on trees. Wildlife Habitat: Trees provide many different useful functions for wildlife. They provide a place for birds to create a nest for their young, and much needed shelter for many animals. Many trees also provide food for many different animals. Oak trees provide acorns for a large variety of animals in the area throughout the winter. Other trees such as Serviceberry, Cherry, Cranberry and crabapples also provide much needed food and habitat for many species of birds, insects and animals. Screening: You can use trees to screen against noise, a bad view or the wind. A tree windbreak can reduce your energy consumption by as much as 10-20%. When properly placed a wind break will push the air up and over a house. Evergreens work great for year round windbreaks. Watch them grow: It can be quite enjoyable to just watch the tree grow and change throughout the years and seasons. A lot of people will routinely check up on the progress every week or so just to see what is new. Watching how some trees can grow by the foot rather than inches can be an awesome sight to see. You can see how fast an Elm can grow or how slow and purposeful a Bur Oak grows. Fall color: All deciduous trees have some fall color but many have an exceptional fall show. 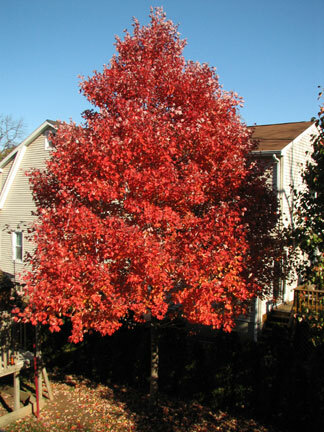 Maples can give off bright red color or a range of red orange and yellow depending on the variety you choose. Oak trees will give you great reddish colors then often hold on to their leaves until spring to give you fall and winter interest. Planting a maple and an oak near each other would give you great fall color combination because the oaks will still be in full color when the maple leaves have all fallen. 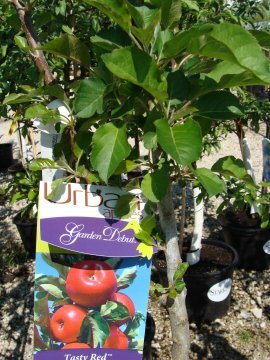 Edible landscape trees: There are many fruit trees that are hardy for our cold Missouri winters. You can have fresh apples, cherries, plums, apricots, peaches or pears. Most need two different varieties to have proper pollination so you can have a variety of fruit available. There is sense of pride you get from picking some fresh fruit from your yard for your snack or meal. A tree for every location: Regardless of your yard there is a tree that can work for you. You can find trees that can handle the full day sun or one that loves the shade. There are trees that can reach 70 feet tall and 40 feet wide and some that only get 5 feet tall and 3 feet wide. How to select a tree: There are a few key things to consider when you first begin picking out a tree. First, you should know how many hours of sun your new tree will get and what time of day it gets it. Second, you should know how wet or dry the area is. Does a lot of water sit or run through the spot you are thinking of planting a tree? Third, know how big of a tree you want to be there. It is best to know this before showing up to buy your tree. All trees seem like they are small when on the nursery lot. Fourth, where is the tree being planted? Are you planting the new tree along a street or is it in the middle of a field? Fifth, have an idea what type of soil you have. Is it heavy clay or sandy? This will greatly inform you on what trees will thrive.